Many application software and programs for Windows operating system will install and add menu items or options into right-click contextual menu which pops up when user right clicks, obviously, on files and folders on Windows Explorer and Desktop or even shortcuts and icons in Start Menu. More often than not, most right click menu items created and added by setup installers silently, unaware and unknowing to the system users. As the result, the items, commands or options that contained inside the right click context menu when right clicking on files and folders can get very long and cluttered, where most of the items is seldom used or infrequently used. To make matter worse, some software programs do not uninstall cleanly to remove all the traces installed on the computer, leaving behind defunct, useless and invalid right click menu items. Windows does not have built-in utility that allows user to deal with right click menu items directly, whether to delete, remove, erase, add, create, modify or edit. However, with the help of Registry Editor, user can directly edit the registry keys and values that handler control the addition and removal entries in right click menu. Normally, the registry keys are known as context menu handlers. Note that different registry keys may responsible for right click contextual menu items for files and folders, although some items may overlap both categories of objects in the system. The “*” represents apply to “All Files”, as similar to asterisk used in DOS or search function. Click on the + sign next to the ContextMenuHandlers key to expand the branch. There should be many registry sub-keys (folders) where each items represent a entry item in the right-click menu. The name of the registry sub-keys should have an identifiable program name associated. Thus, to remove and delete an right click menu options, just delete the appropriate registry sub-key. Normally, all right click menu entries that belongs to a program (such as WinRAR, 7-Zip and WinZip) will all get deleted when the program’s context menu handler key is removed. Tip: It’s always recommended to export and backup the registry key before deleting it. As a drive (root directory) of a partition or drive is also a folder, hence the need to search for context menu handlers in two registry locations. Click on the + sign next to the ContextMenuHandlers key to expand the branch. There should be many registry sub-keys (folders) where each items represent a entry item in the right-click menu. The name of the registry sub-keys should have an identifiable program name associated. Thus, to remove and delete an right click menu options, just delete the appropriate registry sub-key. 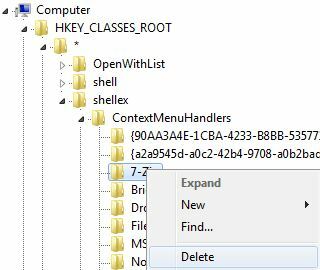 Normally, all right click menu entries that belongs to a program (such as 7-Zip, WinRAR and WinZip) will all get deleted when the program’s context menu handler key is removed. Note: It’s also possible to disable a right click menu item or option instead of deleting it. The trick below is useful for people who does not want to delete a right click contextual menu handler just in case it’s needed in future. The right click menu items will be hidden from view when it’s disabled. There are also some software utilities with GUI (graphical user interface) that automates the registry deletion process to remove right click menu items’ handlers. 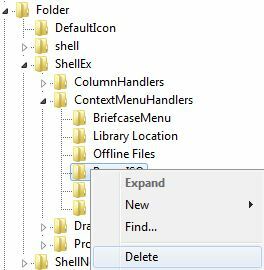 For example, ShellExView, which allows user to manipulate shell extensions, including right click context menu handlers. In addition, it’s also possible to disable and hide the right click menu items instead of deleting it. Tip: Some programs notably Adobe use different registry keys to append the context menu handlers. Here’s how to remove Adobe Drive CS4 right click menu item and how to remove Adobe Bridge CS5 right click menu entry.